Probably my favorite all time smoke. I am a hugh fan of Montecristo. The medium body is smooth and works for any weather. The taste of the flavor is recurring after the smoke is out of your mouth. It fits nicely with either whiskey or red wine. Great cigar! Have smoked 4 of the cigars. One smoked very uneven although the flavor was excellent. This was my first box of these beauties. The flavor was magnificent and the draw was just perfect. A great cigar, especially for the value and performance. Got these and some Padron's to stock my new humidor...nice cigar! Great cigar. One of my favorites. Smooth, even burn, well constructed. Tasty and mild, good price. The only issue I had with these tasty sticks is that one had a severe draw issue. I had to use a draw poker to open it up. They started out ok. Went out a lot. Finished less than pleasing. Would not buy again. You can't Gi wrong with Montecristo. The robot size is really great when you don't have time to smoke the full size. 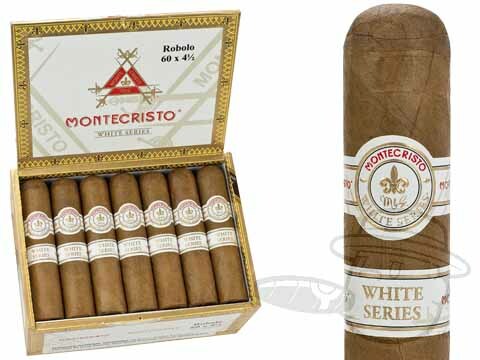 Montecristo White Label Robolo is rated 4.4 out of 5 based on 22 customer ratings.